Usually we have our pumpkin carved days before the trick-or-treating begins. This year we procrastinated and carved it the same day. Years past my daughter wouldn't touch the pumpkin "guts" with a ten foot pole. Things changed this year! With a big smile on her face she dug right in and helped pull out the seeds and stringy mess. She wanted a "sort-of-scary" pumpkin face. We compromised and made friendly eyes and nose and a mouth with scary teeth. Our pumpkin masterpiece may not measure up to our friends' elaborate Thomas the Tank Engine and Dora carvings, but we had fun creating and cutting. Someday soon the kids will be able to carve their own jack-o'-lanterns. I'm looking forward to seeing what kind of carvings they'll create. I wanted to post about this Halloween book yesterday, but ran out of time. 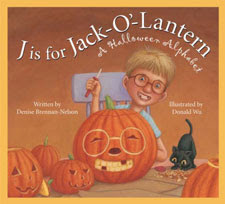 J is for Jack-O'Lantern: A Halloween Alphabet covers Halloween from A to Z. Each page spread features one letter of the alphabet, starting with the letter A. The frightful and fun holiday words include Autumn, Frankenstein, Haunted House, Nighttime, Scarecrow and of course Jack-O'Lantern. There's also a corresponding short, rhyming poem for each letter and the left side bar on each page spread features factual information pertaining to Halloween and the featured Halloween word. It's a fun and informative book to browse through during Halloween. The large illustrations by Wu show an array of both spooky and happy Halloween sights. A little Halloween candy for the eyes! My daughter liked the moon-lit nighttime full of shadows, and I favored the green corn maze with the confused maze walkers. Going back to those pumpkins, did you know that the custom of carving scary faces to ward away spirits comes from Ireland and the Celts? Learn facts like that and more in this great Halloween read. 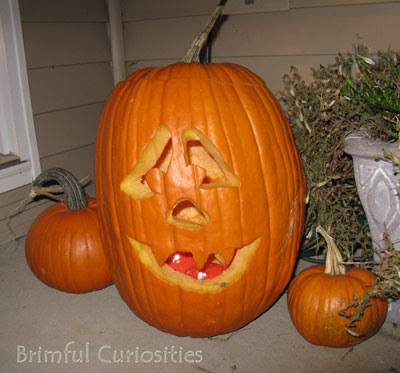 Just out of curiosity, what kind of pumpkin carvings did you make this year? Were they scary, funny or intricate? Please share. I'd love to hear all about them. Hope you had a good Halloween! Sounds like a fun book! :) We didn't carve pumpkins this year--we painted them. Still messy, but not as hard.